These are very nice. Giving to guest at 75th birthday party. Other gifts will be inside bag,but they will be surprised at this one. Thank you. As always, your items are great. Absolutely love! The bows come a little crushed but we literally ironed them out and they look great! Can’t wait to place them at each setting at my wedding! Thanks! 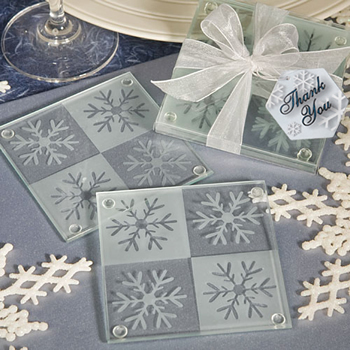 I absolutely love these snowflake coaster. although I thought the description read they where a 3pk but thy are a 2pk. I still love them and they where delivered so fast, delivery was expensive but well worth the product. I love that they come already packaged with a Thank you note and beautiful ribbon tied so professional looking. Really liked the coasters. Very nice product. Was sorry to see one set broken. There were several sets loose and they moved around in the box during delivery. Would suggest to tape those in place to help prevent breakage. Bought these as party favors for our annual Christmas party. Super cute and so reasonably priced. Arrived a day early and in perfect condition. I switched the Thank You cards to Merry Christmas! Everyone loved them!! Nicer than I thought they would be. Definitely worth it, would buy again! I was very impressed with the quality of the product for the price. They are heavy, like they should be, very sturdy, cutely wrapped and were shipped out immediately. I am thankful that all I will need to do for my banquet (of 300) will be to place them on the table. Will be shopping again next time with your company! Thank you so very much!! Will be nice for wedding party gifts. Arrived in good time and good shape. I ordered these for my future daughter in laws bridal shower that we are going to hold in October. The couple is getting married in late January, 2018 and these are perfect little gifts for the table. They are well packaged and delivery was prompt. I will order again in the future. Great item and service! A crowd pleaser because everyone can use them. Our guests loved the coasters!! These also make great little gifts for customer appreciation. I will definitely be ordering from nicepricefavors.com next year!! I ordered these coasters as favors for my daughters Snowflake Baby Shower. They were PERFECT, the guest loved them. They arrived quickly, already packaged with a bow. Needless to say we were very happy. Definitely will order from here again! I liked my favor and it was reasonably priced. The coasters were given as a party favor, and everyone loved them. They were nicely packaged and were delivered quickly. I liked them so much, I kept a set for myself.